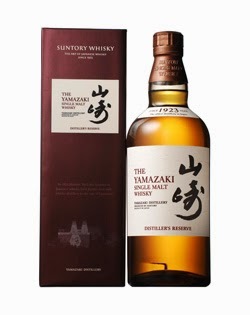 The Distiller's Reserve is a new single malt from the Japanese distillery of Yamazaki. The whisky has been constructed to showcase the qualities of Yamazaki's young single malt, which have been matured in ex-red wine casks for three years. These have been accentuated by blending with older malts matured in ex-sherry casks (aged approximately 20 years) and Japanese oak (called mizunara) casks, which are 12+ years old. All the casks used have been hand selected by Shinji Fukuyo, who is only the fourth Chief Blender in owner Suntory's 90 year history. Yamazaki was Japan's first single malt distillery. It began production in 1923 and was founded by Shinjiro Torri, a man widely regarded as the pioneer of the Japanese whisky industry. It is located in the town of Yamazaki in the Osaka Prefecture, which sits roughly between half way between the major cities of Kyoto and Osaka. It is owned by Suntory, the company that Shinjiro Torri formed in the early 1920s, and has a current annual production of six million litres. This will soon increase as plans have been announced to add four more stills at the distillery, which will increase capacity by 40%. The Distiller's Reserve joins the 12, 18 and 25 years old expressions to form a core range. They will be occasionally joined by limited editions and older expressions, as has happened in the past. Suntory recommend drinking it neat or in a highball with ice and soda water. The Distiller's Reserve is bottled at 43% ABV and will be £42 per bottle. It will be available very shortly in specialist whisky retailers. The colour is deep golden yellow and the nose is expressive and full of heady aromas. There is plenty of vanilla and honey to kick things off, before some delicious fruity aromas come through (think of morello cherries and raspberry jam, plus hints of raisin and sultana). There are also underlying fragrant wood spices present including fresh oak, cinnamon, nutmeg and sandalwood. On the palate, the whisky feels soft and velvety with lovely prominent notes of vanilla, honey and coconut to the fore. There is a lovely delicate and quite sugary sweetness that is reminiscent of something like icing sugar or candyfloss. Further fruity and woody spice notes come through and these add an impressive depth and complexity - think of the morello cherries again plus raisins, bitter orange, cinnamon and oaky tannins (these add a nice 'grip' to the whisky and it clings to the tastebuds as a result). There are also hints of cocoa powder, ginger, toasted nuts and something floral. The finish is of decent length and begins sweetly and slightly syrup-like, but quickly becomes woodier and spicier. This makes it increasingly dry and the tannic notes from the ex-wine cask matured whisky are definitely most evident now. There is also a slight nuttiness that is most reminiscent of hazelnut. The launch of the Distiller's Reserve has created a ripple of excitement in the whisky community as it is the first new core range whisky to be released by Yamazaki for a number of years. Much like version from its sibling distillery of Hakushu (click here to read our review of Hakushu Distiller's Reserve, which is being released at the same time), this new whisky has taken the brand in a slightly different direction to its other core releases. Suntory have done well with the two Distiller's Reserve releases. Amidst the current fuss being created in certain sections of the whisky community about 'no age statement' whiskies, they have produced two crackers and at a competitive price. The quality of both whiskies is superb and would justify a higher price in our opinion.